Pubs were a major feature of the area – in 1871 Albany Road alone boasted five public houses with seven more just a barrel roll away. Hard work often went with hard drinking, and drink became such a problem in the area that a stretcher to carry drunks away was permanently stored in Addington Square, ready for a lift to the local police station. William IV pub, now demolished, photo courtesy of Southwark Local History Library. Drinking in Camberwell has a long, if not always proud, history. Records from way back in 1695 show the vestry (local government) raising ‘2 shillings and 6 pence from men sitting in ye ale houses drinking in sermon time’. It’s easy to imagine the lure of the local inn – back then Camberwell was a rustic parish village, surrounded by open common land and market gardens. Even in 1797, a reward was offered for info as to who owned the pigs roaming freely in the roads. By Victorian times the scene was transformed. The Grand Surrey Canal arrived in 1810. In the decades after, the London Metropolis surged outwards, fuelled by the Industrial Revolution, engulfing outlying villages. By 1890, the Burgess Park area was a dense warren of crowded terraced streets, belching factories & warehouses of all shapes and sizes… and, of course, public houses. In an age before water sanitation, beer and spirits were often seen as safer to drink than water. Gin or ‘mother’s ruin’ was frequently blamed as the cause of all vice. Having opened the floodgates in the 1690s by allowing unlicensed production, successive 18th century governments scrambled to stem the tide of debauchery unleashed. 1751 saw the Gin Act, famously supported by Hogarth with his cartoon ‘Beer Street and Gin Lane’. The 1830 Beer Act later abolished tax on beer altogether, considering it a ‘far more salubrious or rather a far less destructive liquor than gin or whisky’. The British beer-drinking culture it boosted is arguably the one we know today. Despite the Temperance Movement which followed – a campaign to purge alcohol from public life – the area’s pubs generally thrived throughout the Victorian era. Hitting back at the ale-houses, distillers reacted with extravagant opulence – the new ‘gin-palaces’, offering a luxurious escape from domestic poverty. Hard work often went with hard drinking. Drink became such a problem in the area, that a stretcher to carry drunks away was permanently stored in Addington Square, in a small windowed shed. Drunkards were strapped to the stretcher (complete with a rain hood – community policing at its most compassionate…) for a lift to the local police station. Locally, 1901 saw the brewery on Wells Way replaced with more improving fare; the bath-house/wash-house/library still standing today. Victorian refreshment for the body and mind. 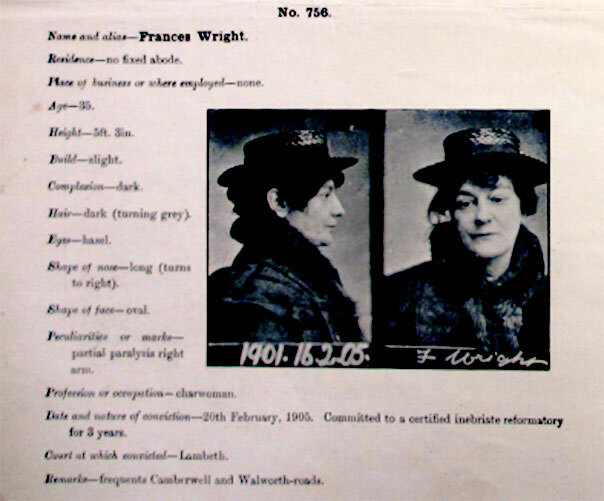 From Portraits and Descriptions of Habitual Drunkards published by Metropolitan Police, in accordance with Licensing Act 1902. Courtesy Southwark Local History Library. In 1906 thriller writer William Le Queux, describing the Albany Road area, wrote ‘Tousled-haired women were mostly the landladies, evil-faced scowling creatures who drank gin and talked with that nasal twang so essentially the dialect of once-rural Camberwell’ . But it’s perhaps the clearance of a patch of urban London that best highlights just how massively popular the simple public house once was. Now almost a nationally endangered species, there were, at one time or another, between 13 and 30 pubs in or around what became Burgess Park. Think about that – in the 1880s you’d have been able to see at least 3 from this, or almost any other, spot. Albany Road alone once had 11 drinking establishments, albeit some were very basic beer-shops, offering little more than shelter, a seat, and ale. For those looking for less boozy refreshment, the area was also home to many mineral water, ginger beer, and lemonade factories. Most famous of them all was R Whites, purveyors also of such forgotten exotic drinks as double soda water, cordials and fruit syrups, and ginger toddy. Even as late as 1980 there were still 9 pubs open for business. But they were already becoming increasingly isolated, as the terraces and factories around them – once the homes and workplaces of thirsty locals – were vacated and torn down, brick by brick. 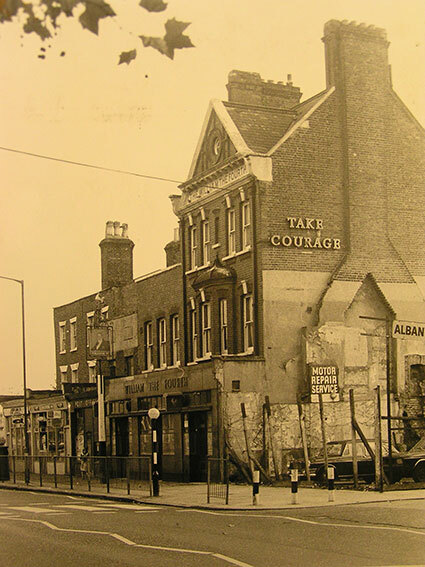 By then the council had proposed that all but the Lord Nelson pub on Old Kent Road would go. The last pub within the park we know today went in 2012, with the demolition of the long- disused William IV, on Albany Way. It’s now an outdoor gym. It was memorably cloaked in ghostly white shortly before its demise – as part of another great Art in the Park community project. So was there a heroic community defence of the pubs of the area? Well, with the odd noble exception, seemingly not really. Combing the local press clippings of the day, it’s hard to escape the impression their fate was sealed before their true community value was fully realised. Or was it just that the very drinkers who might defend their locals had already themselves moved away? Either way, through the eighties, sadly, the pubs closed one by one. Today the Thomas A Becket at the Old Kent Road entrance, is the nearest watering hole still standing, though sadly only intermittently serving a pint. It’s famous as the Canterbury Tales waypoint, which once overlooked the site of a medieval gallows, and one-time host to David Bowie & Sir Henry Cooper, learning their respective trades. And one other noble survivor also recalls the Park’s boozier past – The Lord Nelson. We had a comment last week from Simon Dear. It’s so interesting, we added it to the Memories page. Do check it out!